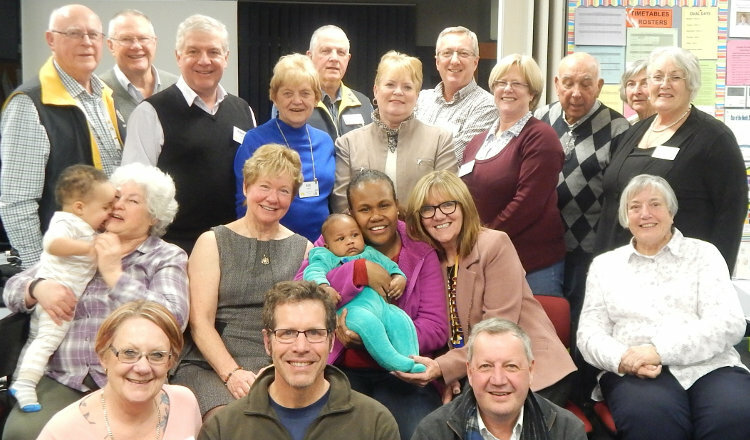 Mum Freda with her gorgeous son Fitzpatrick, surrounded by members of the sponsoring Rotary Club of Jerrabomberra . ROMAC is a Multi-District Activity of Rotary Districts in Australia and New Zealand that assists children aged fifteen years or younger, by bringing them to Australia or New Zealand for life saving or dignity restoring procedures to improve their quality of life. Cases are accepted only when the required medical treatment is not available to them in their own country. The binding principle of ROMAC is that each incoming patient is regarded as a being a project of a Rotary Club. The ROMAC Regional Chair must ensure that, prior to arrival of the patient, a Rotary Club within that Region agrees to undertake the role of Sponsor Club for that patient for the full period that they are in the country. Prior to arrival of the ROMAC patient, the Sponsor Club is to minute the fact of their sponsorship in their Board minutes and advise the District Insurance Officer, the District Governor and the ROMAC Regional Chair accordingly. The Sponsor Club acknowledges in their documentation that, by their resolution, the Rotary blanket insurance policy covers all participants during the treatment and caring of the patient with insurance protection as provided by the National Insurance Plan for which each Club pays the annual premium to their District Administration. Separate medical indemnity insurance coverage is provided independently in respect of the treatment and care of the patients by medical practitioners and hospital authorities.